Another March…another chance to call them as I see them. Judging from performances in the Marches of long ago, I do not excel in seeing two and a half weeks into the future. No matter---often wrong, never in doubt continues to be my mantra, in March as in life. After the field was announced, I did my “eyeball-bracket-picks” for practice. Now after isolating myself (not difficult for a reclusive curmudgeon) with the data for a couple of days I have torn down that bracket and rebuilt it with my 63 guesses of the moment. In a few cases I allowed myself to become confused by the facts. Iowa State, Xavier, Baylor, Oklahoma State and Florida were swapped out as I sent Purdue, FSU, SMU, Louisville and UVA to my Sweet Sixteen. Listening to and reading the oracles of college basketball expertise, I have heard cogent and persuasive rationales for upset picks in all first round games except the one-seed and two-seed matchups. I cannot recall when I saw as many games that could go either way, with just a couple of blessings from the basketball gods. If they win tonight, NC Central will make Kansas earn it…KU will know they have been in a game. NCCU is very well coached. Nevada averages 80 points per game and is #7 in free throws attempted. Creighton’s loss of its point guard enhances Rhode Island’s chances. Michigan/Oklahoma State will be a helluva game. Michigan does not foul or turn it over---OSU scores over 85 ppg, shoots at 40% from three, appears at the foul line all night and sinks 78.7% of those shots. Arkansas is a one-point favorite, so anything goes. Seton Hall is the 7th best rebounding margin team, but doesn’t score like Arkansas. Middle Tennessee out-performs Minnesota in almost every metric. Minnesota gets to the line a lot, but is average at converting and ranks a lowly 81st in offense efficiency. Butler and Winthrop have similar metrics---Winthrop has big advantage at foul line and scoring. Neither team turns it over or fouls…should be a well-paced game. Since the game is in Orlando, I give the edge Florida. East Tennessee and the Gators are closely matched in the stat department. ESTU shoots 49.1% (#10) and 38.3% (#44) from three. Even though UNC-Wilmington grades out above UVA in turnover margin (surprised me), foul line performance, scoring (48.2%, 85.2 ppg); I go with UVA. The Pack Line Defense is impossible to prep for, and is a shock the first time. UVA has the element of surprise. Since you never know which Baylor team will show up, I switched to SMU. If they can focus for six games, Baylor has the horses to make the finals. Saint Mary’s could slow Arizona down enough for an upset ambush. I wanted to pick Florida Gulf Coast, but couldn’t pull the trigger when push came to shove (to mix a couple of metaphors). I tried to convince myself to go with Princeton, but stayed with Notre Dame. The Irish will get a tough workout. 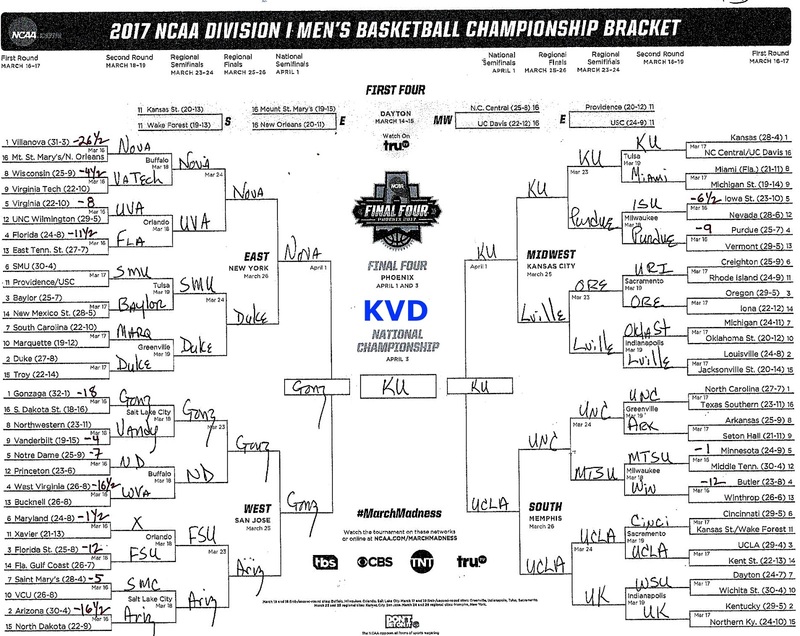 I would not be surprised to see either Kansas, UCLA, Gonzaga, Arizona, Louisville or (begrudgingly) UNC cut down the nets. This year’s most efficient offenses: Oklahoma State, UCLA, Villanova, UNC, Michigan and Duke. At least two double-digit seeds reached the Sweet Sixteen in 16 of the past 20 years…at least one in 29 of past 32 years. Pop Quiz: Is freshman talent better than senior experience? Offense has slightly outweighed defense for the last 15 champions according to KenPom. 11th for offense—15th for defense. In the past ten years, only UNC is the only champ (2009) to finish in the Top-100 in tempo. Two more things: We will see the same commercials over and over and over. Then over and over.